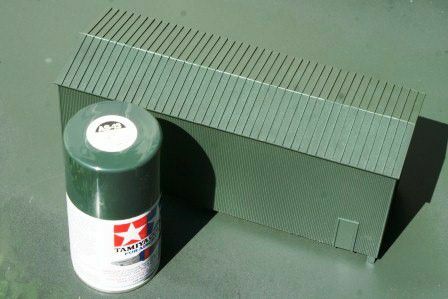 A can of "USAF Green" spray paint is used to paint the exterior of the shed. This small can yielded just enough paint to finish the job. ©2011 Ryan C Kunkle, licensed to About.com, Inc.
Judging from the few satelite images available, the coal unloading shed being modeled is painted a dark shade green. The easiest way to paint this model is to simply use a can of spray paint. You could airbrush as well if you prefer. Sometimes it is helpful to wander out of the model trains section of the hobby shop. When painting, you'll often find a better selection of colors in with the military models. You'll find just about every shade of green, gray and earth tone you could want here. Pactra USAF Green was used on the coal shed. Paint the entire exterior of the model. Don't forget to get up under the overhangs of the roof. There was just enough paint in this small can to complete the job. Paint carefully and don't overdo it. Weathering will come next, so if you have any thin spots, they'll be easy to cover. A can of flat black spray paint is used for the interior and to apply a little light weathering to the exterior of the coal shed. ©2011 Ryan C Kunkle, licensed to About.com, Inc.
With the large doors on each end of the building, the interior of the coal unloading shed is very visible. You could paint the interior any color you'd like, but in an environment like this, there is only one color it is going to be after a few train-loads of coal have been dumped inside - black. Painting the interior flat black actually has some additional advantages: it will help prevent the interior lighting from causing the walls to "glow" and the same spray paint can be used to put a little weathering on the exterior as well. As with the exterior, spray paint was used for all of this. When it comes to generic colors like flat black, you can save a few dollars and go to the hardware store. Just test the paint on a scrap of styrene (or whatever plastic you are using) first to make sure it won't attack the surface. Bargain brand black paint cans are usually twice the size and 20% of the cost of the same color in a hobby shop. Paint the interior first. You want a smooth and even coverage over the entire interior. Take care not to get a heavy spray on the exterior walls while doing this. If you aren't very handy with a spray can, you may want to mask the exterior during this process. You will have to move the model several times to get paint into all of the interior spaces. When the coal dust starts flying, it isn't all going to stay within the walls. A little weathering on the exterior of the building will help tie it in to the suroundings. Use the same can of flat black paint to apply a light overspray to the exterior, including the roof. Hold the can a greater distance from the model and apply in light, short strokes. Build the color gradually and in places where the dirt is more likely to accumulate. You may be surprised how quickly just a little paint can make a difference in the overall appearance. Why not an airbrush? You could do all of this with an airbrush if you'd prefer. For a job this size, a can of spraypaint is often just easier and faster and quality suffers very little. If you want additional and more controlled weathering, you may want to add another layer with an airbrush later. Interior bulbs and a security light fixture above the door make the coal shed safe for employees no matter when the next load of coal needs to be dumped. ©2011 Ryan C Kunkle, licensed to About.com, Inc. Lighting adds another dimension to any building. The lighting for the coal shed is a simple affair with three bulbs. The main lighting for the interior comes from a pair of grain-of-wheat bulbs from Model Power. The bulbs are rated for 14 volts, but bulb life will be greatly extended by running on about 12 volts. The two bulbs are held to the peak of the roof with electrical tape. The wires are run across the peak of the roof, then down the front right corner to a hole in the platform. Black electrical tape both secures and completely hides the wires against the black interior. For an extra touch of realism and to add a little detail to the otherwise plain exterior, a security light was added above the door on the front side. Although there are no scale working models of these modern lights, they are easy to make from scratch. Lights of many styles can be made from clear styrene, conventional styrene and electrical tape. To learn how, just follow these complete instructions. The light is illuminated with a small Model Power grain-of-sand bulb. This bulb is also rated for 14 volts, but requires a resistor on one lead. The wires for this bulb are routed against the back of the wall and down to the hole in the platfrom like the others. From the building, the wires are routed beneath the platform where they are attached to a pair of bus wires that carry 12 volts DC around the layout for scenic lighting. This bus is seperate from track power and is supplied by an inexpensive transformer. Solder all of the connections and wrap with electrical tape for insulation. The floor of the coal shed painted to look like weathered concrete and steel grating. Note the middle piece has been drybrushed with grimy black to bring out the tread details on the styrene. ©2011 Ryan C Kunkle, licensed to About.com, Inc. The last major step in completing the coal shed is the floor. The foundation for the floor was completed earlier. All that remains are the concrete and steel grates of the floor itself. Without any interior photos to work from, the floor is freelanced. Coal must be unloaded from the bottoms of the hopper cars (the facility is not equipped with a rotary dumper.) Therefore there must be a pit and conveyer system beneath the floor. Between the rails the pit is open. On the powerplant (front) side of the shed, the pit is protected by steel grates on which workers can stand to open the hopper doors. The grating will allow coal to slip through to the conveyer below. The far side has grates 2 feet from the rail and a simple poured concrete floor the remainder of the way to the wall. Plastruct No. 91701: Z scale Tread Plate. Although it is labeled for Z, the tread looks right for HO. All of the flooring can be made from one of the two sheets. And by some strange chance of luck, the sheets are exactly half the length of the shed. Cut four strips of the material: 2 2' wide and 2 6'. Paint the grates with flat black paint. To highlight the grate detail, drybrush a little grimy black paint across the top of the grates. This will give a subtle highlight to the raised surfaces. To model the concrete floor, some ordinary flat .060 styrene is cut into a 4' wide strip as long as the interior. Spray the sheet an aged concrete color. Weather with an overspray of flat black. One of the great qualities of styrene - with the right paint it can be made to look like almost anything. The completed floor provides a safe work area to open the hopper doors. Lighting in the building is adequate to see some detail, but not powerful enough to warrant super-detailing. ©2011 Ryan C Kunkle, licensed to About.com, Inc. The floor panels made in the previous step may now be installed in the building. One end will be supported on the bracing at the base of the walls. The rest will be supported on the foundation of I beams. Glue the large grates to the brace against the front wall and the concrete to the brace on the back. Apply some glue to the tops of the I beams and place the shed on the foundation. Insert the thin grate strips between the concrete and the rail on the far side of the shed. The model coal shed captures all of the character and railroad operations of the prototype power plant in a manageable size. Small details can make a big difference. ©2011 Ryan C Kunkle, licensed to About.com, Inc.
At last the project is complete! All that remains are a few more details to complete the scene. The interior of the building is rather sparsely detailed. As the only function of the structure is to provide a shelter for crews unloading the hoppers, not much is needed. A few small details are all that is needed, brooms, water hoses, etc. Despite best efforts to keep it clean, a few sprinkles of coal around the floor will complete the scene. Add a few safety signs near the doors. Warning decals are applied to thin .010 styrene. This provides a smooth surface which can then be glued to the walls. Lastly, blend the building into the scenery by applying ballast to the track and ground cover around the base. Of course, you'll want some coal amidst all the stone and dirt. All that's left is to bring in a unit train of coal.